Business education at a Catholic university should engage students and faculty across the university in critically examining the purpose of business in society. Following the best practices of leading business schools, the Catholic business curriculum has mostly focused on the shareholder and stakeholder approaches - with the shareholder approach being the predominant view. Creatively engaging the Catholic Social Tradition (especially the “community of persons”) can bring a richer appreciation of the purpose of business in our contemporary society than either the shareholder or stakeholder approaches. We argue that far more discretion to pursue various corporate purposes in manifold ways exists than is frequently appreciated by business managers and those who educate them. This article examines how, given this legal and moral discretion, the Catholic Social Tradition is a rich resource for teaching corporate purpose, and reveals how tapping into a religious tradition with a long philosophical discourse can shape a rich dialogue in the curriculum as to a company’s moral direction. We contrast two philosophies of business: an Association of Individuals (the shareholder and stakeholder approaches) and a Community of Persons (mission-centric approach), and their respective views of corporate purpose. While business scholars tend not to question their underlying anthropological presuppositions because of the desire to be “practical,” a business education grounded in the liberal arts must engage the first principles of its discourse. 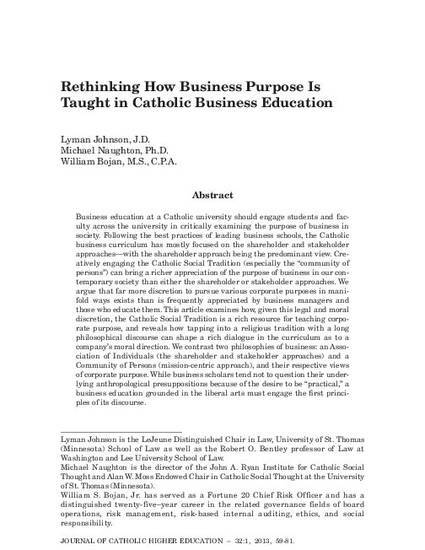 Lyman Johnson, Michael Naughton, & William Bojan, Rethinking How Business Purpose Is Taught in Catholic Business Education, 32 J. Cath. Higher Ed. 59 (2013).